For this week’s meatless meal, I decided to revisit mushrooms. I always love to look of those big Portobello mushroom caps in the grocery store. So when I found a recipe for stuffed mushrooms, I just knew we would love them! 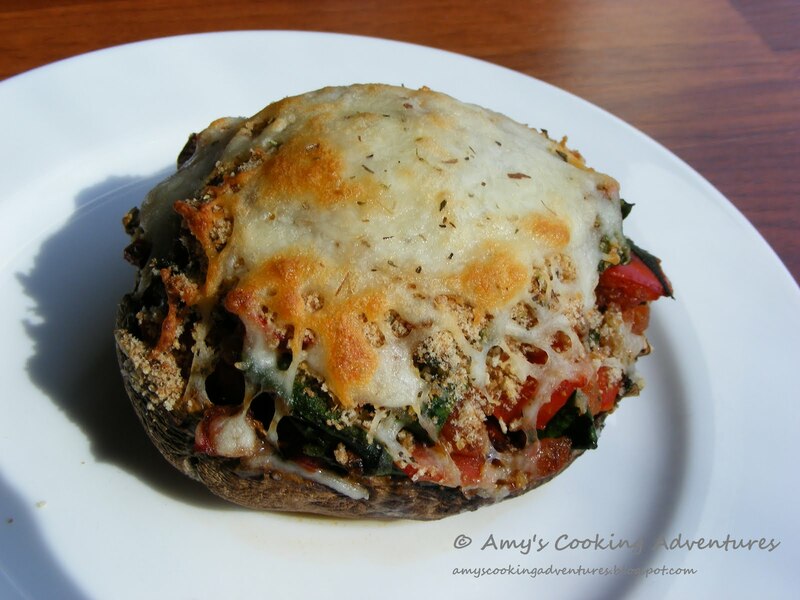 These Stuffed Mushrooms make a wonderful light meal. 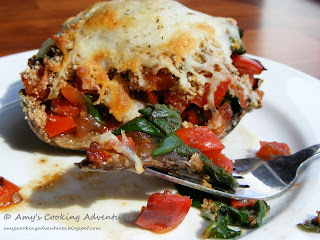 I just loved all of the fresh vegetables that were stuffed into the mushrooms! Note: you could also stuff this mix into smaller mushrooms for a wonderful light vegetarian appetizer! Using a spoon, scoop out the gills and stem of the mushroom, discard. Brush the mushrooms with balsamic vinegar and place on a baking sheet. Heat the olive oil in a large sauté pan. Add the onions, garlic, red pepper and salt. Cook until tender. Add in the tomatoes and spinach. Cook until the spinach is wilted. Sprinkle each mushroom with bread crumbs, mozzarella, and Italian seasoning. Bake the mushrooms for 10 minutes or until the cheese is melted and beginning to brown.